For my response to this month’s theme, I returned to some of short pieces I wrote last time I made a big move. 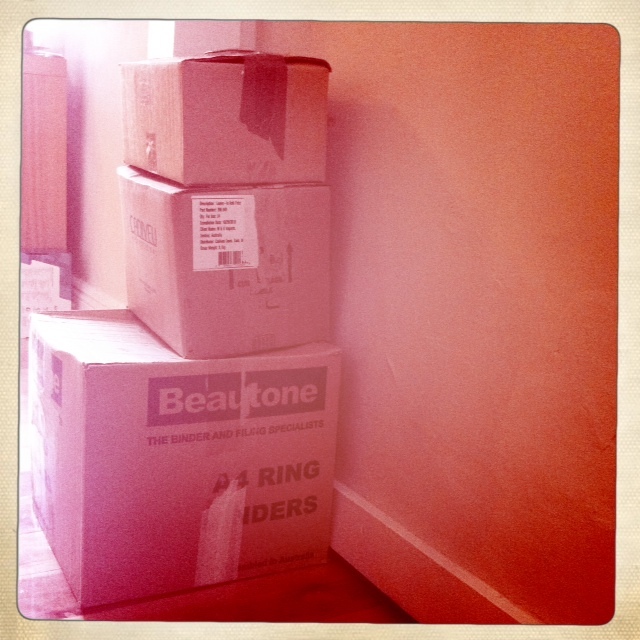 Since most of my energy in February seemed to be taken up with moving house, it seemed appropriate somehow. Unfortunately I was unable to get it together enough to actually put the story together into something that made sense. But then perhaps that’s okay, since it’s really about the chaos of packing up a life. I thought I’d type out what’s in my writing journal pretty much verbatim. I’d love to hear if you think this is going anywhere. Her fingers were dry from handling all the cardboard and she had a collection of bruises on her legs. But before her stood a pile of brown cardboard. It sat in the middle of the room, surrounded by the absence of her furniture and the trails of dust and cobwebs that had been hidden beneath it. The curtains were freshly washed, still a little damp and slightly crushed. The space around the box mountain looked smaller than it had when the contents of the boxes had been spread around it. You stand next to her in the doorway as she looks around again and sighs. “Why do I own so much crap?” She doesn’t want an answer. Another box marked ‘books’. There have been thousands of these already, you think. Your daughter’s reading habit doesn’t quite keep up with her book-buying one. She sighs again, running her fingers over her own handwriting on yet another box of books, then follows you downstairs with it. You worried vaguely about having an accident as you drove through the city, thought maybe you should pull over until the tears subsided. But then you knew you’d only turn around if you stopped, and that wouldn’t help anyone. She’d looked small in the rear vision mirror as you drove away. Not at all grown up. You knew she was probably crying too – and that her ridiculous new boyfriend would have no idea how to handle it. He’d helped her find the dingy flat that was to be her first home away from home, and in doing so had proved to you that he had no idea what your daughter might need. The place was filthy, for starters. Your daughter’s new housemates had layers of newspaper on the dining table so they could just throw away the top one after a meal, rather than wipe down the table; the drain in the bathroom was full of hair; everything was covered in grimy dust. Your daughter’s bedroom was full of someone else’s furniture. Even with some of the knick knacks and books of hers that you’d brought down with the rest of her clothes, she looked out of place in the room. You told yourself, as you continued to drive away from her, that you’d only thought all that because you were being overprotective – that probably also explained why you thought her boyfriend was an idiot. The thought wasn’t comforting though. It only made you cry more – you felt sorry for yourself. And it wasn’t true anyway. In your garage there are three boxes with her name on them, and several bags that aren’t labelled but that you know are hers. About once every six months – or more often if you haven’t heard from her in a while – you wake up early, pad down the internal stairs and stand in front of the small pile of her things. Both you and her mother are guilty of reminding her a little too often that these things are taking up space in your garage, but if she came to take them away you’d be upset. The boxes are labelled in her neat handwriting – their contents described in brief detail on the masking tape that keeps them shut. They are mostly full of old things: high school and university books, photo albums, knick knacks, CDs. One box is simply labelled “special things”. Many times, as you’ve stood in front of her boxes and bags, you’ve wondered what constitutes “special” to your daughter. What would she pull out of that box? Undoubtedly it would be a collection of things that mean nothing to you, and whose story you will never know – trinkets from old friends and boyfriends, from far-flung places; letters from people you’ve never known, photos of people you’ve never met. One day she’ll come back for these boxes – she might even open the “special things” box. The extra space in the garage would be good, certainly, but you’re not sure you could bear watching her going through them. You like the idea that you have a part of her here, neatly contained and labelled, and somehow mysterious. Often, as you look at the boxes and run your fingers over her handwriting, you wonder what she is doing now, all those plane-hours away. You like to imagine that she is sitting at the kitchen table drinking tea, or reading to her own small daughter. You don’t understand why, but she feels she needs to do it. She’s packing up again – this time leaving him, when it’s always been him leaving her. The him has changed over the years, but it’s been pretty much the same story every time. Being in a relationship with your daughter, you imagine, is very intense. But no, this time she’s leaving him, and that’s at least half the reason why you think maybe he’s the right one. She’s determined though; packing boxes, taking things that are definitely his, leaving things that are definitely hers because she’s unsure in her frenzy. As she packs she babbles at you, her voice so close to tears. You should really be packing in another room, to speed the process up, but you can’t bear to leave her alone when she’s like this. Even a little girl she was prone to working herself into a frenzy. Never over nothing, but always over something that didn’t really deserve all the energy she was giving it. And there is the other half of the reason you think he’s the right one. Determined as she says she is, every part of her seems to be fighting against her own decision. Her hands shake, as if saying no to the words that are coming out of her mouth. This entry was posted in Family, in progress, moving house, The Monday Project, writing and tagged fiction, Monday Project, moving house, redux, writing by avocadoandlemon. Bookmark the permalink.